English; Teori-Praktik An important detail on winter trips is to stay hydrated. When you have to melt snow for all drinking and cooking and low temperatures make it difficult to keep water in a liquid state, it is all to easy not to drink enough. I'll describe a system that I find very satisfactory that I used on my latest trip, described here. 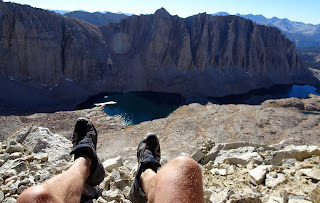 To stay satisfactorily hydrated I need about the same input as during 3-season hikes. This means about 300 ml every hour and maybe double that when I take a meal. And I'm rather keen on my meals. I stop for lunch summer and winter and cook myself a meal and I stop and cook afternoon coffee around 1500 hours. Both these instances give me opportunity to melt snow for drinking water. So I don't carry huge amounts of water. Using this system means that I see no need for Thermos bottles, which I also find a bit on the heavy side. But I know that many winter hikers and skiers only cook morning and night swear by them. Especially if you try to make as much mileage as possible, and take as few and short breaks as possible, like Arctic expeditions. Many, not only expeditioners, do use a Thermos for a lunch consisting of fruit or blueberry soup. Me, I have simply chosen another approach which means that I don't really hunt mileage but consider breaks and hot meals an important part of my vacation. However, irrespective of this, I do think that carrying all the liquid you need for a whole day in Thermos bottles is heavy and impractical, which means that my system could very well be used as a complement to hot soups in Thermos bottles. You just have to carry/transport larger amounts of water if you want to have a whole days supply of water along. The above photo shows the transportation devices I use. After having breakfast I put the small plastic bottles, from Arla Smoothies of 300-330 ml, in the pockets of my anorak or pants to keep them from freezing. I usually give the water an extra boost on the stove, bringing it up to 30-40 C before filling the bottles. That way the water will stay unfrozen even in very cold weather. I've had no problems down to -20--25 C and from my Army days I know that a bottle kept in the "groin pockets" of my pants will stay liquid in temperatures well below that. After one hour of skiing I drink one of the 300 ml bottles, together with a handful of chocolate, raisins and nuts. No matter what the circumstances, especially if the weather is inclement, I know that I need water and calories in order to stay comfortable and in control. But actually doing this sometimes takes some self discipline, maybe combined with experience. 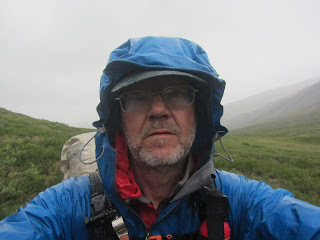 It is always easier to just keep on plodding when the weather is lousy. After two hours and the intermittent breaks the small bottles are empty. I then bring out the bigger Platypus 2 l. It has been rolled up in my insulated pants or jacket at the top of the pack. The amount of liquid kept there depends on how many hours I plan to travel before cooking, and melting snow, again. Usually this means that I maximum carry 1-1,5 liters in all three bottles together. When it is time for lunch I also melt enough snow to refill the bottles, and the same thing goes for when I make afternoon coffee. It's a very simple system that has worked very well for me. One important reason for carrying two small bottles extra, instead of only the big one can be seen above. The first thing I do in the morning is heating water for both those bottles. I heat the water to maybe 60-80 C, that is hot, but not really boiling. I don't want to risk scalding myself miles from nowhere. I then place the small bottles inside my frozen ski boots and let them sit there for the next hour or so. During this time I sit in my sleeping bag, inside my tent, and cook and eat breakfast. When it is time to get on my feet I take the small bottles and place them in my trouser pockets, after which I don the now, if not toasty warm, at least comfortably thawed boots. I imagine that most outdoor people over time will evolve their own system for staying hydrated. The biggest problem for me once upon a time, however, was that I did not make sure that I got enough water to drink during strenous days in the cold. If you are in that situation maybe my system can serve as inspiration for evolving your own. Discuss in Swedish on Utsidan here, and below in English. I like the idea of the two 300ml bottles acting as boot warmers in the morning. I guess having two small bottles like that also means they fit in pockets better and make it easier to keep an eye on how much you're drinking. I'm quite bad at keeping properly hydrated in the winter and these tips will help in future. Yeah, it is really practical. They also serve very well for drying out socks in your sleeping bag by putting the hot water bottles inside. But I usually dry my day socks on my feet, outside the dry day socks. Sorry mistake in my earlier comment, on my feet outside my dry NIGHT socks is where I dry out the damp day socks. Jörgen as usual a very informative post. I often find I have not drank enough water as I tend too easily to keep wandering along the trail. The 300 ml bottles make a lot of sense, because it certainly helps to keep track of the amount of water consumed in a day. I am thinking more and more about a dinner stop in the mid afternoon before continuing in to camp for the night. The 330 ml Arla bottles are a good idea, I like that - cheap, can be recycled, and practical for a couple of uses. I used a 1 l Nalgene and 1l Platypus bottles this winter, and the platys can be a problem if its very cold, then you can walk 30 minutes and they're frozen almost solid. The 1l Nalgene is handy for taking water out of flowing rivers or iceholes, I reckon the 330 ml bottles will be fine too for that use. Will try them next winter. Re: Staying hydrated, I am quite good with that and usually drink every 30 minutes in winter. It needs some discipline to remember to drink, but it is a lot better than walking till your thirsty and tired (and then maybe realizing that your platy is frozen :D ). I've had no problems with the Platypus freezing when I carry it in my pack, wrapped in some insulating clothing. Especially if the water is a bit tepid when I pour it into the Platy. But of course, if I leave it in the cold air it freezes pretty fast at 15-20 below. During the night I did let the Platy freeze since I didn't need it as a hot water bottle in my sleeping bag on this particular trip. In the morning I just poured some hot water into it and was back in business. Nice tips Jørgen. I also use a Nalgene bottle turned upside with pipe insulation over it. Warm water in that stays warm for a few hours it's no thermos.. but if it ices when I turn the bottle the right way up the ice is at the bottom.